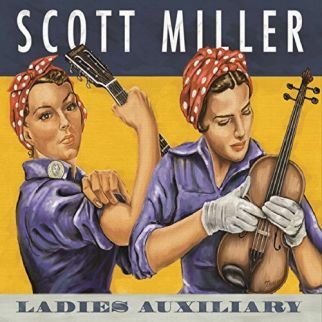 The album title perfectly sums up the back story for Ladies Auxiliary, the latest release from Scott Miller. The definition of auxiliary describes the group as providing supplementary or additional help and support. The musical company backing Scott Miller consists of lady members who step up to the instrumental assembly line for Ladies Auxiliary ready and able. Scott Miller approached Anne McCue about guitar work on the album, and was so impressed by her playing he offered Anne the producer’s chair. Finding players was as simple was wandering out her East Nashville front door and Anne McCue added to her guitar parts on Ladies Auxiliary with Bryn Davies (bass), Rayna Gellert (fiddle/banjo), Jen Gunderman (keys) Deanie Richardson (fiddle), and Megan Carchman (drums). Opening cut “Epic Love” serves as a song template for the team playing on the album. Guitar strums and thick bass notes welcome in a slow build of notes that flicker around the melody as the music rises with the heart confessions made to a past relationship. A founding member of Knoxville Alt country band, The V-Roys, Scott Miller blends more acoustics into the instrumentation for Ladies Auxiliary than the electrical force found in the mix of Rock’n’Roll and Country that was ground zero for his former group. Scott’s pen still dips into the wry humor that finds its way into many Alt Country storylines. Ladies Auxiliary stomps feet to introduce an acquired taste “Mother-in-Law”, heads to the county fair on the arm of “Jacki with an Eye”, and checks off the ‘other’ box for a resume that lists affiliations as ‘Gay Shite Muslim Nazi steelworker Jew for Jesus’ as it moves on a cowpoke sway requesting “Get Along, Everybody”. Present day in “Lo Siento, Spanishburg, WVA” shows tough times for the town as “This River’s Yours/This Valley’s Mine” takes sides in a wandering tale. Scott Miller tenderly bids goodbye in “Body and Soul” as he balances desires and needs in “Someday/Sometime” and offers his personal theory of relativity for “Middle Man” while Ladies Auxiliary travels “Ten Miles Down the Nine Mile Road” to put flesh and blood into a Country tale.